James St. James lives in infamy. As the author of Party Monster, the 1991 memoir about New York “Club Kids” that spawned a movie starring Macaulay Culkin and generations of glamorous eccentrics mimicking their antics and aesthetics, St. James occupies a special place in queer history as a self-obsessed documentarian in the best possible way. His second book, 2007’s Freak Show, is a coming-of-age story about a young, flamboyant boy who runs for prom queen. Created for a young adult audience, there’s way less ketamine in Freak Show than in Party Monster, but an equal amount of drama. The first half of the book — the bullying of the protagonist, Billy — feels autobiographical, while the second half — Billy running for prom queen and emboldening his peers to let their own “freak” flags fly — is a fantasy St. James was able to live out on the page better than in his real teen life. These days, St. James lives in L.A., parties a lot less and creates video and social media content for World of Wonder (the production company behind RuPaul’s Drag Race and Million Dollar Listing, as well as a ton of other shows and movies). And as of this month, the film adaptation of Freak Show, directed by Trudie Styler (yes, that Trudie Styler) is available for streaming. When we spoke on the phone recently, he asked if he’d ever corrupted me. The answer, of course, was a resounding “yes” — corruption that began with coating my face in glitter as a means of fooling bouncers into accepting my fake IDs. St. James and I spent the rest of the hour talking about Freak Show, the queer youth of today and the death of subcultures like the Club Kids he helped usher into the mainstream. Why did you aim Freak Show at a young adult audience? What were you like as a young baby gay? I spent time between Fort Lauderdale and Saginaw, Michigan. My dad was in Florida and my mom was in Michigan, and they were both horrible in their own ways. I sort of bounced back and forth, but there was a gay scene in Florida that I could sneak into when I was 14. I’d ride my bike down the highway to go to the gay bar and stuff my bed with pillows in case anyone looked for me. In Saginaw, I sort of hibernated. That’s where a lot of personal development took place. I read all the time because that was my escape. I was always discovering someone or something — the Surrealists or the Dadaists or Gertrude Stein. Then, when I was 14, I stumbled upon “Popism” by Andy Warhol and that really opened doors in my head. That’s when everything came together for me. I realized there was a tribe of people I could finally relate to — they just weren’t in Florida or Michigan. I moved to New York City in 1984, and there’s a video in [documentarian] Nelson Sullivan’s archives of me spotting Andy Warhol on the street in the city for the first time. You totally see me fangirl out, a little James St. James melting down, screaming about Warhol being my hero. Are you interested in today’s queer youth culture? It’s changed significantly since back then, of course, but I’m curious if it’s something you track. I don’t go out like I used to, but I’m still connected with a lot of queer nightlife, especially through social media. And I still zero in on new characters I find interesting and create stuff with them. It’s beautiful to be a queer kid today. Our queer youth is still battling, but there’s a lot more options now. Drag Race alone has had a profound effect on today’s youth. It’s fabulous, and it’s wonderful. That said, while I’d never want to revert back to the old days — when our identities weren’t as accepted and accessible — there is something I miss about the days of gay being transgressive. I miss grimy hookup bars and the experience of those little spaces where we carved out safe-zones for our transgressive behavior. Those pockets hardly exist anymore, at least in this country, but they were amazing. When I was growing up, it was subversive and life-changing to stumble upon people like Divine, Grace Jones and John Waters. There was real discovery to being part of a subculture. These subcultures I find so beautiful — the mods, the punks, the goths, the gender-bending of the early 1980s and the New Romantics and Club Kids — all had time to percolate. These groups of people spent years together before the media started to stumble upon their ideas or aesthetics and spread them. The Club Kids began around 1989, and it wasn’t until like, 1990, that the talk show appearances began. Now, whatever happens on Twitter or Instagram spreads and influences others almost instantly. Take Hungry, this very unique drag queen in Berlin. She always creates these wonderful, fascinating looks and has now been doing Bjork’s makeup lately. Back in the day, drag queens, artists and subcultures had time to experiment and develop their looks, their persona, their artistry before it became commodified by others. Today, these kids on Instagram copy Hungry’s looks immediately. They bite them right away, before their creator gets to even figure out what that expression may grow into and become over time. Sometimes I wish things moved a bit slower. I’m surprised how influential those original Club Kid aesthetics continue to be, though. 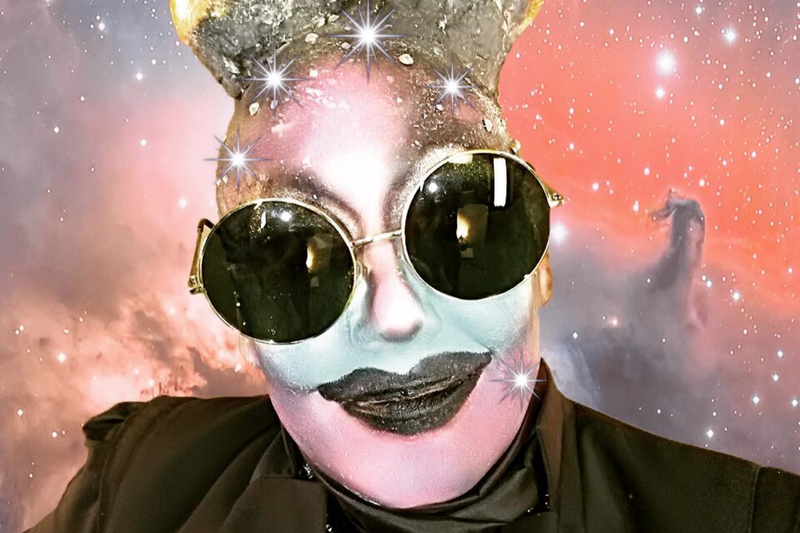 A huge portion of the alternative visual culture on Instagram is still Club Kid mimicry. I always encourage people to pull out what’s actually inside of them and play with that. I see a lot of Amanda Lepore or other versions of popular Club Kids, and I’m like, “No, no, no, no.” What makes legends like Amanda so great is that they pulled something out of the sky and channeled it into themselves. That’s what gives these extreme characters their beauty. Enhance who you are instead of copying someone else. Do you ever get sick of your reputation or Club Kid identity? That’s funny. On most days, I’m not even aware of it. Occasionally, someone on the street will come give me a hug or something, but I’m basically just to and from work and with my family — and they treat me like crap and everybody at work treats me like crap, so it’s easy to forget. I remember one time, like 15 years ago, I was standing in line at a bookstore and Ray Manzarek from The Doors was in front of me. This girl came in and looked over at the line and started screaming, “Oh my God, I can’t believe I get to meet you!” Ray Manzarek was like, “Here it goes again.” But she ran over to me and started freaking out. It’s rare for those moments to happen, but when they do, it’s funny to remember that time and the cultural space I occupy. I’m always humbled by it I guess. I’m starting to feel old as I experience one cycle after the next.